Natural Resources cocoa, coffee, timber, minerals (gold). 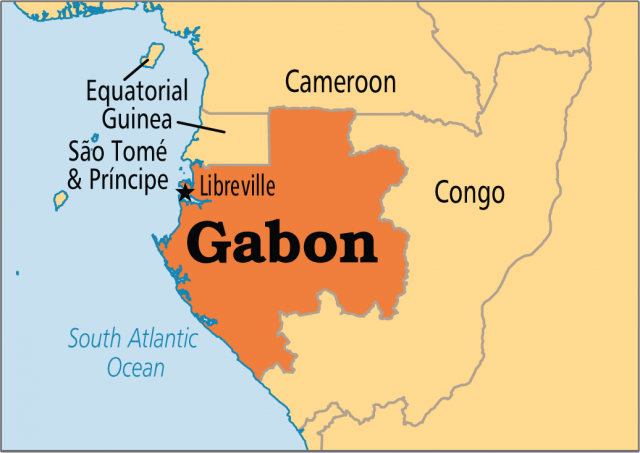 LOCATED ON THE ATLANTIC OCEAN coast in Central Africa, Gabon shares borders with CAMEROON, Republic of the CONGO, and EQUATORIAL GUINEA. Gabon is a unique contrast to what one might think of in a country straddling the equator. Most of the landscape reflects the influence of Gabon’s major river, the Ogooue, West Africa’s major river between the CONGO and the NIGER rivers. The Ogooue basin dominates the eastern two-thirds of the country. There are two other lesser regions within the Gabon landscape, the Woleu-Ntem River basin in the north and an interesting coastal plain in the west and southwest. Approaching the country from the sea, one of the distinctive features first noticed is the extensive parkland that appears in the hills just beyond the coast. Rather than mangrove swamps, many places have broad open grasslands on terraces beyond the coast that are intermixed with larger old growth trees. Beyond the parkland, the land rises in a long arc of highlands that run roughly parallel to the coast and that separate the upper Ogooue basin in the interior from the ATLANTIC OCEAN. There are also a number of lakes on the coastal plain below Lambarene that collect water for the lower Ogooue River before it empties into the Atlantic. The southern coastal plain is actually an extension of the sand beaches running north from the mouth of the Congo. The northern portion of the coastal plain is separated from the upper Ogooue region by a series of plateaus ranging from 1,000 to 2,000 ft (300 to 600 m) above sea level. Between the two coastal plains is the country’s major highland region, the Chaillu Massif that rises to an elevation of 3,215 ft (980 m) at Mount Iboundji, Gabon’s highest point. In the north, the plateau lands, which reach some 2,500 ft (760 m), begin to merge as one moves to the northeast, until they join the Cristal Mountains. In the southeast is the hot and arid Bateke Plateau at 2,700 ft (820 m). Gabon has a typical equatorial climate. Rainfall is heavy and varies by location and time of year. The annual average is almost 120 in (305 cm) at Libreville, the capital, to 150 in (381 cm) on the northwest coast. Most of the rain comes between October and May. Temperatures show little seasonal variation, averaging about 81 degrees F (27 degrees C) each month of the year. Surprisingly, it does not feel as hot as one might expect for a country astride the equator, and nighttime lows are often near 60 degrees F (16 degrees C) in the highlands. About three-fourths of the country is covered by dense equatorial rainforest. Within this rich ecological zone grows the Gabon mahogany, a hardwood tree that forms the backbone of Gabon’s wood industry. The dense forest vegetation supports a wide assortment of animals including gorillas and elephants. Gabon does not have many mineral resources, but those that it has are important. There are large reserves of manganese and significant deposits of high-grade iron ore in the interior. There are also commercial quantities of uranium. Offshore, there are deposits of petroleum and natural gas. Finally, while Gabon is a rich country by African standards, many Gabonese are not sharing in the wealth. The disparity in the quality of life is encouraging rapid migration from rural to urban areas.